Email : Noemi - mother of Luijoe at [email protected]- or contact me at my cellphone at +639178101582 if you want to talk about your grief. December 24, 2006- Salamat Dok "Positibo ang Pinoy"
I was interviewed on how I transformed my grief to something positive. This was live show aired on December 24 at 6:00 AM. A lot of viewers in and outside the Philippines were able to watch this show. read more? This episode was shown on June 2 at 1:00 PM and replayed June 2 at 11:00 PM and on June 4 at 4:00 PM. read more? Appeared as one of the guests for ALI show. The Ali Show featured mothers like Agnes Prieto, Alma Miclat and Vilma Dee who have moved on towards a positive resolution of their grief. "Fallen Cradle" is a book of 22 stories by parents who have a lost a child. The book is a sharing of a most painful journey—that of confronting and accepting the death of one’s child and the struggle to live again. I am one of the 22 authors. It was formally launched today at Powerbooks Greenbelt Makati. The book is edited by award winning authors Agnes Prieto and Ricardo de Ungria. read more? The episode of “Pieta, Pagdadalamhati ng isang Ina” aired at QTV MOMS at 5:30 PM almost a month after our taping .read more? My blog about my grief journey and recovery is launched. 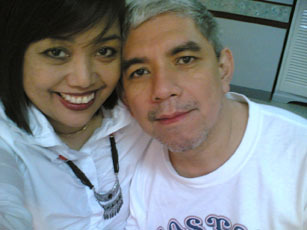 February 9, 2006- Taping for "Pieta, Pagdadalamhati ng isang Ina"
Appeared as guest for MOMS at QTV. The Episode title is "Pieta, Pagdadalamhati ng isang Ina". Other guests include, Gina de Venecia, Irma Santiago and Alicia Alonzo. Gina lost KC to a fire accident on December 16, 2004. 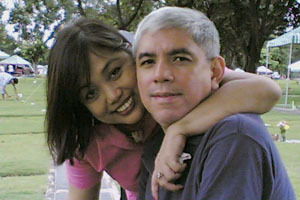 Irma Santiago lost her son, Luigi Santiago (a popular TV director) just recently on June 8, 2005 in a gunfire incident. Alicia's son, Jon Hernandez passed away 12 years ago due to a car accident. The episode will be aired last week of February. The schedule will be shown at their Episode guide. I had some difficulty during the Q & A portion because the questions were mostly in Tagalog and my speech gets garbled in Taglish. English is still my preferred language when it comes to deep discussion of issues. I finally wrote about Luijoe's life and death. Luijoe's story will be featured as part of the 21 stories in the book "Fallen Cradle" , compiled by Agnes Prieto on the loss of a child . Watch out for the book launch around late February 2006. View the powerpoint presentation I made after the closing of the Purpose Drive Life Seminar sponsored by the Pathways of Ligaya ng Panginoon. It was about how I started The Compassionate Friends in the Philippines and my positive resolution in my grief journey. The Compassionate Friends first meeting was held at the Greenhills Christian Fellowship. I will be starting the first chapter of The Compassionate Friends (grief support following death of a child) in the Philippines on Wednesday, December 21, 2005 . I even designed the The Compassionate Friends website. First meeting is tentatively scheduled on Wednesday, January 18, 2006. Please email Noemi L. Dado at [email protected] or send an SMS to 09178101582 for the venue. The Compassionate Friends (grief support following death of a child) - The mission of The Compassionate Friends is to assist families toward the positive resolution of grief following the death of a child of any age and to provide information to help others be supportive. The Compassionate Friends is a national non-profit, self-help support organization that offers friendship, understanding, and hope to bereaved parents, grandparents and siblings. There is no religious affiliation and there are no membership dues or fees. My husband and I joined the Healing Circles Grief Support group founded by Agnes Prieto. I finally found a grief support group after years of searching for one. If you need grief support just contact the Healing Circle (, 24-hour mobile phone number (0920-5525952) . Sharing our grief to those that have lost a loved one is a comfort. Almost 5 years since my son died. I've updated the links. Coming soon. A blog . Hopefully I can join the "Inang Naulila sa Anak" (INA) that would counsel grieving mothers. " I read the Opinion column that Gina de Venecia and Ali Sotto organized it. But how to join? There are not much details. I would like to help other grieving mothers. New Angel graphic with Luijoe in wings - Special thanks to Sara 's Aras Imaging and Danny Halmbohm's Spiritual Art Works for the beautiful angel image of Luijoe. 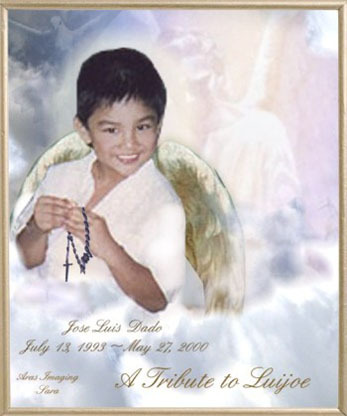 This site is dedicated to our angel, Luijoe, who was born July 13, 1993 and got taken away to heaven on May 27, 2000 at the age of 6 years old. This memorial site was created on June 19, 2000 although the memorial guestbook was set up on May 28, 2000 by Martin, my daughter's friend. The domain , angel-luijoe.net was purchased on September 19 , 2002 by Luijoe's dad and is registered for the next 3 years. This was designed by his mom using notepad for the HTML and adobe photoshop for editing graphics. The design was inspired with an "angels theme" because of Luijoe's fascination about angels and heaven weeks before he died. This page will always have something new so check this page for updates. To navigate, please click the links on the left frame. I made this memorial site to unleash my grief into something creative. It is my wish to share with you the wonderful things that Luijoe had in his earthly life and how his death has touched our lives. I know some of you might not be comfortable with our painful loss. It is my intention to touch your life and to comfort other griveing parents out there. The only help a parent can find when they are grieving the loss of a child, is in the company of another who fully understands that loss. 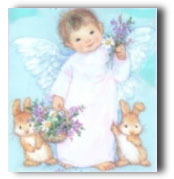 Little Angel Heaven , Grangran's Angel Graphics for most of the graphics used in making this site. Joanne Cacciatore for granting permission to use "Whisper of an Angel", an excerpt from "Dear Cheyenne"
HostRadius for the hosting services during the first 5 years . My daughter, Lauren for allowing me to print out some of her journal entries. 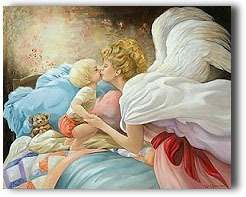 Special thanks to Sara 's Aras Imaging and Danny Halmbohm's Spiritual Art Works for the beautiful angel image of Luijoe. Sara utilized portions (altered) of two of the works of spiritual artist, Danny Halmbohm, "Thy Will Be Done" and "Welcome Home" (the dove), as well as, her own sky and cloud photos and graphics to make luijoe's angel image. "You will always be my mommy"
Hold me, mommy, close within"